Thanks to the Foodbuzz Tastemaker Program I received a box FULL of Ghiradelli Chocolates to try! I was so excited I started bouncing off the walls... No seriously I did. Then I opened the packages... Yeah... Getting chocolates in the mail in the middle of our AZ heat didn't work out too well, lol! They did have a completely melted ice pack in there in the attempt to keep the chocolates from melting, unfortunately that didn't work. These were SO melted, they haven't really recovered even being stored in the fridge. Once chocolate melts, it changes the texture completely, and I learned this lesson the hard way. Now don't get me wrong it tastes fantastic still, but to eat it as normal chocolate is impossible, since as soon as I remove it from the packaging it starts to melt again. It is however great for baking! So instead of pairing it with some fruit or beverage, I paired my chocolates with Pumpkin and baked it into waffles... Oh yeah baby! They were AWESOME! I can't believe how much we enjoyed these, in fact we even ate these cold as midnight snacks... haha! These waffles came together SO fast, the longest part was honestly just the baking, in other words, waiting for the darn waffle iron to cook each one... haha! But it was worth the wait, served up with some warm maple syrup, these are such a wonderful treat full of fall flavor! In a large bowl combine the flour, sugar, salt, baking powder, and spices. Whisk together until fully combined. Then in a medium bowl combine the vanilla, pumpkin, milk, oil and eggs. Whisk those together until full combined, then pour into the dry ingredients and mix until everything is combined and the batter should be thick. Next coarsely chop the chocolate, and using a spoon fold into the waffle batter. Heat your waffle iron, and spray with cooking spray. Using a measuring cup, measure out the amount of batter needed to fill your waffle iron, for my round one that was about 1/2 cup. Spread out slightly, and lower the top of the iron and let it cook until golden and slightly crispy. Repeat with remaining batter. Serve warm with your favorite syrup. These were just outstanding, they were fantastic fresh out of the iron (because you know it's torture to wait for them all to finish baking! ), and were delicious smothered in syrup too! The addition of the dark chocolate was out of this world, it took an already delicious waffle and made it spectacular! My Little Sous Chef devoured these, and then asked for more, so I'd give them a 4.5 star rating! P.S. Don't forget about the Giveaway going on until this Thursday, Sept. 29th for a $100 American Express Gift card!! There's still time to enter! Wow! These waffles are over the top. They sound so good with even the pumpkin, but then you threw in the dark chocolate, oh my! I'll have to make these soon. Sorry about your melty chocolates, due to the weather I still am hesitant about ordering certain foods to be shipped. The first thing I thought of was Christmas morning when I saw this post. My nieces and nephews always get up at the 2 or 3 am, so this would be a great meal after all the packages are opened. Yum-you have some good taste when it comes to waffles! I love waffles! And these sound perfect! I want these waffles! They look and sound so amazing!!! Nom-Nom..this looks amazing..as always! You will make me start eating breakfast regularly hahaha..love this combo, and your photo is mouthwatering!! 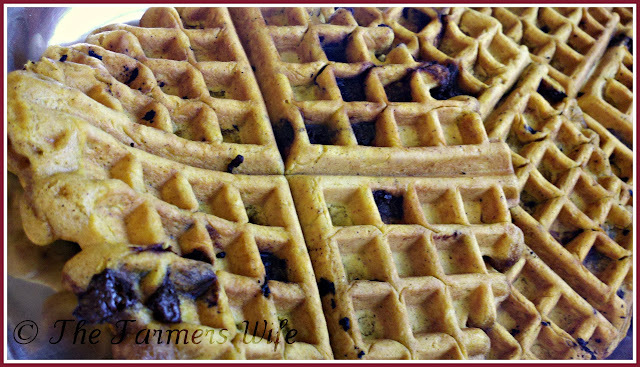 Pumpkin chocolate chip waffles are one of my favorites!! Oh I lov this! I have been looking into making pumpkin waffles some weekend for breakfast! These look so yummy with the chocolate too! Ooh! I love pumpkin everything--but pumpkin and chocolate! What a great idea. Waffles look scrumptious!